Posted on 30, January 2019 by EuropaWire PR Editors | This entry was posted in Automotive, Aviation & Aerospace, Belgium, Chemicals, Germany, Industrial, News, Technology, Transportation & Logistics and tagged aerospace, Arne Böttcher, aviation applications, composites, Covestro, EconCore, EN45545 standard, FAR25.853 standard, fire, FST requirements, hermoplastic materials, honeycomb cores, honeycomb panels, JEC World 2019, Klaus Kraner, Maezio™, polycarbonate, railway, railway applications, smoke, thermoplastic composite solutions, Tomasz Czarnecki, toxicity, TRANSPORT, ultra-light honeycomb structures. Bookmark the permalink. EconCore N.V. and Covestro are combining their technologies in order to produce strong and lightweight honeycomb panels with outstanding performance. The products comply with Fire, Smoke, Toxicity (FST) requirements for public transportation applications, including railway and aerospace. EconCore N.V. und Covestro bündeln ihr technisches Know-how für die Produktion sehr leichter und gleichzeitig stabiler und leistungsstarker Wabenplatten. Die Produkte erfüllen die FST (Fire, Smoke, Toxicity)-Anforderungen für die Verwendung in öffentlichen Transportmitteln wie Bahnen oder Flugzeugen. LEVERKUSEN, 30-Jan-2019 — /EuropaWire/ — Partnership between EconCore N.V. and Covestro has been announced with the aim at producing stronger, lightweight and Fire, Smoke, Toxicity (FST) requirements compliant honeycomb panels and cores targeting public transportation applications, including railway and aerospace. So far both companies have heavily researched and worked on different materials that are lightweight or ultra-light with specific grades and features. EconCore is capable of producing ultra-light honeycomb structures in an economic way, with a high variety of material combinations that can be fine-tuned in order to meet customers’ needs. While Covestro has dealt with a wide range of polycarbonates and blends with specific grades to meet the FST performance required by railway and aviation applications. Additionally, Covestro is currently working on a range of lightweight thermoplastic composite solutions under the brand name Maezio™. The two companies are now teaming up to optimize the FST (Fire, Smoke, Toxicity) performance of honeycomb panels in order to meet different application requirements. 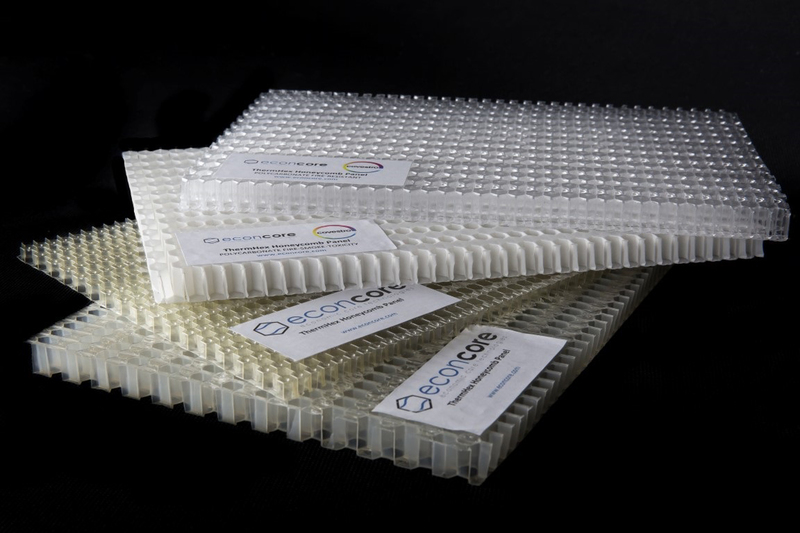 Covestro and EconCore plan to select the right combination of polycarbonate grades and composites for the honeycomb core and skin and at the same time adapting the parameters within EconCore’s honeycomb technology. Preliminary tests on the FST (Fire, Smoke, Toxicity) performance done on semi-finished, laminated honeycomb panels, are indeed very encouraging. Sandwich-panels with different material and technology combinations have already been produced and evaluated, fulfilling critical tests of EN45545 or FAR25.853 standards for various applications. EconCore’s newly developed and patented manufacturing process demonstrates significant cost saving potential due to a high-speed and fully integrated continuous production process, where thermoplastic polymers are directly converted into a honeycomb structure and where, in addition, the sandwich skin layers can be immediately laminated onto core. Covestro and EconCore will both exhibit at the upcoming JEC World 2019 exhibition. Covestro is among the world’s largest polymer companies with EUR 14.1 billion sales reported in 2017 while EconCore, based in Leuven, Belgium, is the world leader in technologies for economic honeycomb sandwich material production.